There is nothing that captures the spirit of a place quite the way a county fair can do. A warm and sunny summer day, the smell of fried dough and fair foods lingering in the air while kids dart excitedly from ride to ride, all playing out to the symphony of sounds from people conversing over classic cars and prized animals. It’s easy to blissfully lose oneself just taking in all there is to experience. Annual county fairs are among one of the oldest New York State traditions. Originally a place where people would gather to exhibit their livestock and show off their agricultural achievements, county fairs have since expanded to include not only these events but also everything from games and rides to food and shows. 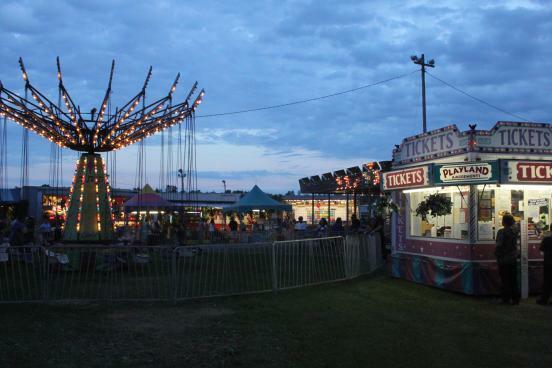 This year happens to be the 172nd anniversary of the Ontario County fair, and there are so many diverse events coming to this year’s fair there will be just about something for everyone. While the primary focus of the fair is on the strong agricultural history and industry of Ontario County, there are also events ranging from classic car shows and pig races to tractor pulls and animal shows, good food and fun rides. Though fun for adults the event is also family friendly! There are nightly prize drawings and kids can visit the County Fair website to participate in the annual, “Color and Win” activity. Many of the animals shown are brought to the fair by youths in the 4-H program and while each day has something for everyone, each day also has a different overall theme. The themes, each a day of the fair in the order they are listed, are Fit Fair/Senior Day, Public Servant Day, Remember When, Ag Day, and lastly Family Day. The fair will run July 21st through the 25th at the Ontario County Fairgrounds, located at 2820 County Road 10, Canandaigua, NY. More information, a schedule of events, directions, and costs can all be found at the fairs website, here. I know that I plan on making attending a priority, and I hope to see you there too! Follow the Fair through pictures on Instagram. The hashtag is at #ontariocountyfair.